Stevie Bell is a junior at a elite boarding school built by a 1920s railroad baron. She got in because of her essay, she wanted in because of the murders… She wants to solve them. But cold cases are hard to break, and in the meantime there are new friends to make, classes to attend, secret tunnels to explore... Intriguing and funny, this is a faster read than it looks, and Stevie is a great sarcastic main character! Super sleuth, Stevie Bell, has been accepted to Ellingham Academy, a prestigious school for gifted children. She has been sought out to use her crime solving skills to help solve a hundred year old mystery that looms over the academy. While knee-deep in old mysteries a student is murdered and Stevie must use her skills once again. Set in Vermont, this new series is sure to pull you in! Wow! What can I say about this book, except read it now! 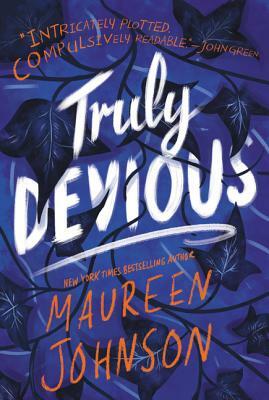 Stevie, a self taught Sherlock, is more than a little obsessed by a cold case she’s discovered online, but when she gets to attend the actual school where the murders took place, she sets about solving it herself. This book is truly devious indeed, with excellent plot twists, riddles and intriguing characters. Set near Burlington, VT.